Saturday I told you how my (120V Jen Ken bead annealing) kiln died last Thursday because my kiln relay went out. Happily, my intrepid postwoman came bearing my new relay (and a spare)from Jen Ken today. 1. Turn kiln off. UNPLUG KILN. 2. Remove the screws holding panel box (orange/red/green) to kiln with 1/4" nut driver or socket (we are NOT talking about the control panel). You MAY have to unattach the thermocoupler wire to have room to maneuver. 3. Take nut & screw from TOP of relay completely out. ONLY loosen bottom nut until relay slides up and out. 4. With pliers, grasping connectors (NOT WIRES) transfer from old relay to new relay, one wire at a time, to ensure exact placement..
5. 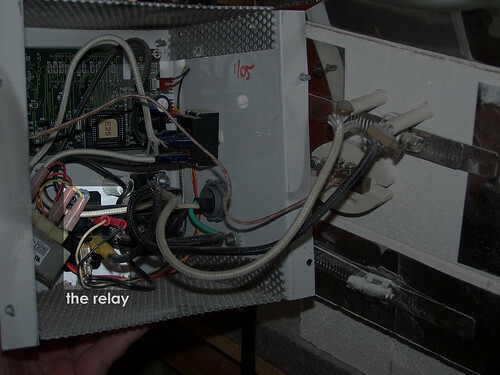 Slide the relay back onto the bottom screw. 6. Then insert screw from outside of box into hole of relay - place nut on top and screw down till snug. Retighten bottom screw until snug as well. 7. If you unattached the thermocoupler wire - reattach, making sure that the red wire goes to the red marked side of the block (or the negative side). Carefully put box back onto kiln (keeping wires from being pinched or touching coil tails). 8. Plug kiln in, turn kiln back on and restart your program. So, some take away points if you ever need to tackle this task for yourself. 1. The directions from Jen Ken are pretty good. Follow them. I mostly did. The part I DIDN't do, because I didn't really understand the point, was not removing the bottom nut - the one right next to the perforated bottom of the control box. You can (unlike shown in the video) leave that one on the bolt and still slide the relay out if you remove BOTH the nut and bolt from the top of the relay. You should see what I mean (though I didn't do it) in the video. Do what they tell you, not what I did. 2. A second pair of hands, not belonging to someone that shares your house AND owes you a big favor, would be helpful. In particular, trying to line up the nut with the bolt, then trying to get the Phillip head screwdriver aligned in the front of the bolt is a trick. None of the process is hard, but getting the nuts and bolts on and off takes time (especially when you're trying to film a video without help and you didn't completely follow the directions). 3. Really just take your time and make sure that nothing is getting knocked around or out of place. I'm not sure why my heating light isn't as bright as before, but I suspect I wasn't quite careful enough. Fixing it will have to wait for another day. Overall, though, as long as you don't make the same mistake I made with the bottom nut (and don't videotape yourself without a friend), you'll cut 5-10 minutes off my time and have a working kiln in the end! P.S. Did you know that there is a 15 minute length limit for videos on an unverified account? A tip for the uninitiated. Verify your account before waiting an hour for an 18 minute video to publish and upload. It's irritating when you discover it's been deleted.